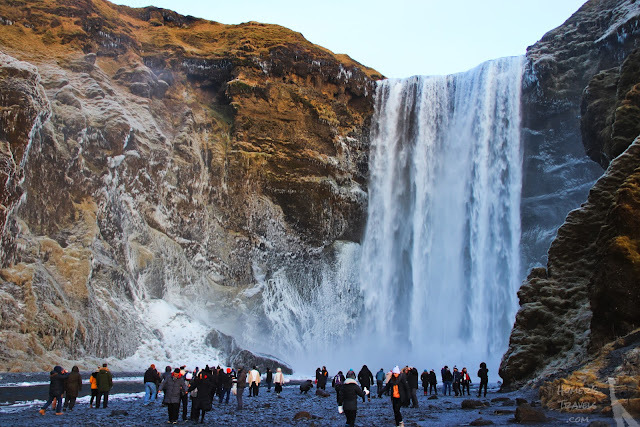 The first day of the new year and our last tour in Iceland was dedicated to the South coast, waterfalls, and glaciers. This was going to be a long day with eleven hours scheduled. We ate breakfast at the hotel and met our tour shuttle at Bus Stop 1. The tour bus headed along the southern coast of the island on the ring road. The first stop of the day was Skógafoss, a large waterfall. View from the top of Skógafoss. I climbed up a staircase with over five hundred steps up to the top of the falls. You could follow a trail along the glacier fed river but not having time I headed back down the stairs and got closer to the falls to get a picture. 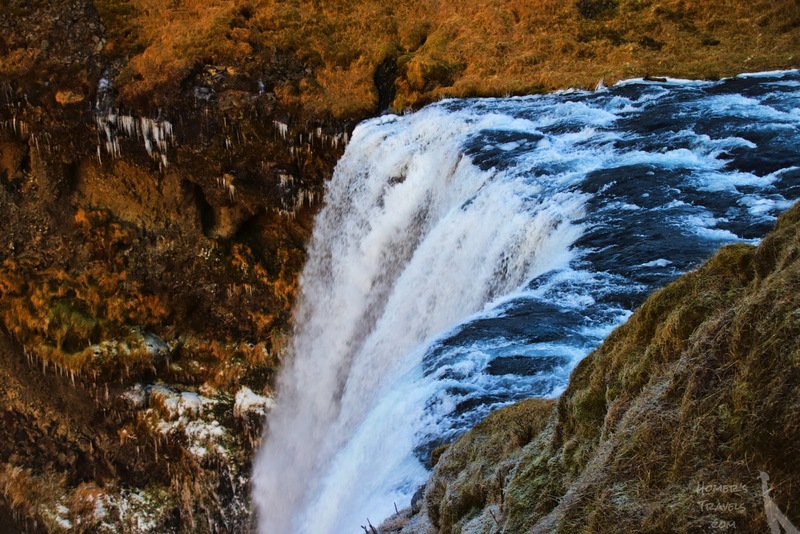 It was early enough in the day that the spray from the falls landed on the surrounding cliffs as snow and ice. The smooth river rock covered in a thin layer of ice made walking difficult. Next stop was an open convenience store where we bought snacks and, for some of us, lunch. Not much was open today as it was New Year's Day. The second stop was Sólheimajökulll. The Wife and I got off here. Others had gotten off at the falls to go snowmobiling/ATVing. The Wife and I would do a glacier hike. The rest of the bus would visit a black sand beach and eat lunch. We signed in, sat outside, and ate our lunches waiting for out trek to begin. 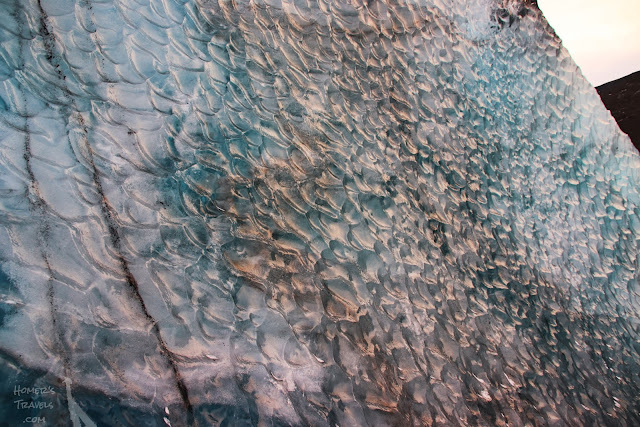 The pool of water at the base of er glacier with floating chunks of ice. The Wife was a bit concerned about how difficult this hike would be when they handed us crampons, harnesses, and an ice axe. We had been told this was an easy hike. She was told the harness was just in case and the ice axe was mostly just for show. Our guide was nice and said that everything would be at our own pace. We walked about a mile from the office to the base of the glacier. Here we were shown how to attach the crampons to our shoes and we started climbing up the front of the glacier. We, in fact, didn't need the ice axes but they were nice to help stabilize you as you climbed. The black you are seeing in the ice is volcanic ash. There is a lot of black sand and dust on the island. Our guide told us stories of her ancestors who had to flee erupting volcanoes with their flocks of sheep. 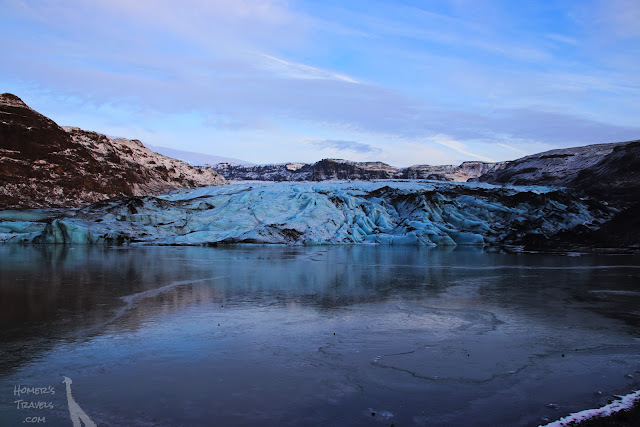 One of the biggest dangers are the flash floods that result when the volcanoes erupt under the glaciers. 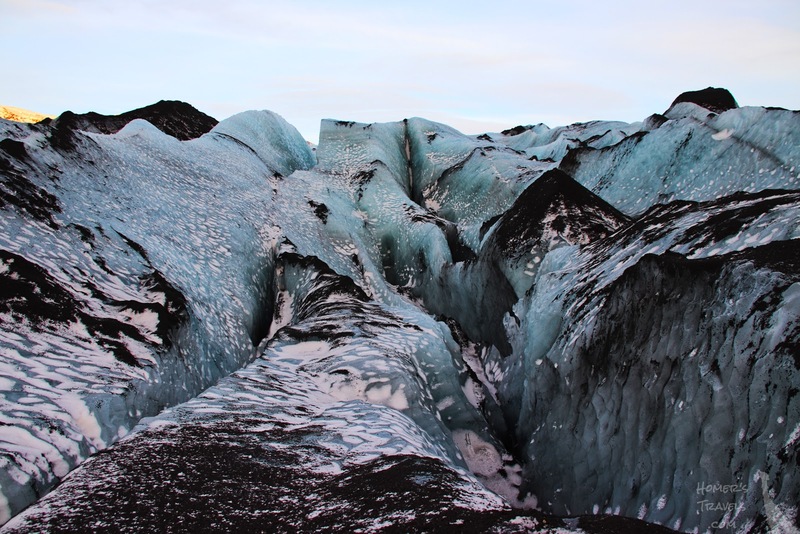 On the glacier - blue ice and black volcanic ash. When we reached the turn around point the hike, for me, changed from a physical exercise to a psychological one. I would look down and see smooth wet ice and my body would refuse to step on it. I had to remind my body that I was wearing crampons and walking on ice was just like walking on dry ground. My brain fought my body all the way down. Interesting melt patterns on the side of a crevasse we hiked through. We got back to the office. The Wife and I, being the oldest in the group by fifteen or twenty years, were the last to arrive. I was so proud of the Wife. It was not easy for her but she pushed through it like a trooper. Seljalandsfoss ... but no walking behind it this trip. 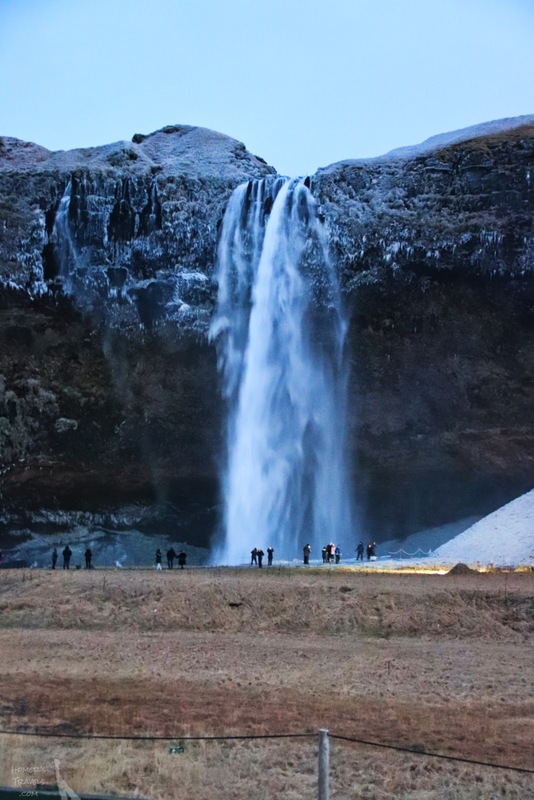 The bus picked us back up and we made our last stop, Seljalandsfoss. These tall falls were once a pitstop for the Amazing Race (season 6). Their claim to fame is a cavern behind the falls that you can enter. Today the ice made it too dangerous so you couldn't go behind the falls. It was also late and we were losing light. Most people just took pictures from afar and bought coffee and snacks from the little store at the parking lot. I have to admit I was a bit waterfalled out by this time. The bus took us back to Reykjavik and our hotels. We ate dinner at the hotel bar though many of their menu items were not available due to the holiday. Today was a good day overall. The Wife was a bit sore from the glacier hike. I was a bit tired too. I'd been having sore throats for a few days now and I could feel that I was coming down with something. Fortunately, whatever it was, it was waiting for our adventure to be over before it hit me full force. Very considerate of it.